I got myself a new camera a couple days ago because the old one was having light metering issues. I was testing it out last night with some flowers that my sis-in-law got me for Christmas. 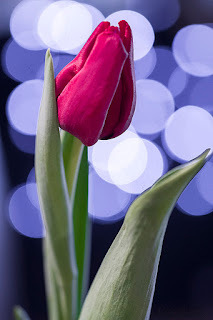 She got me 3 months of bulbs that are in an arrangement and bloom to brighten up the house in these dreary months when all the Christmas festivities are over and we are waiting for spring. I got this shot of a tulip that is coming up against some LED lights and since Fridays are Bokeh days I decided to share this one as I thought it rather festive.